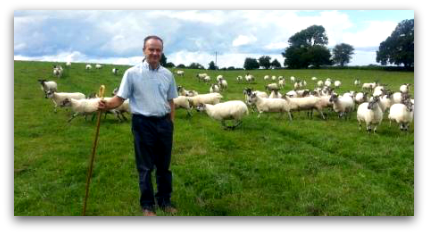 Mella Briscoe is a Dairy, Beef and Sheep farmer in South East Galway. Very prolific with our mature ewes scanning an average of 2.07 lambs/ewe scanned for last 3 years. Low maintenance, only fed meals for 3 weeks pre lambing, lambed outdoors and very few foot problems. I have been a member of the Mayo Mule Group now for a number of years. In the last year I have switched over totally to mules, buying and selling at the group organised sales in August and September. I purchase around 300 mule ewe lambs at the sales and sell ewe hoggets at same. Effectively I do all my business on these two days, which suits me very well as I am employed full-time outside of farming. I find the sales very well organised and well advertised, bringing buyers from all over the country. Once you pay your membership fee and entry fees, you are allocated your pens for each sale day. Business can be carried out in an orderly fashion – no queuing or rushing. Ballinrobe mart staff are always very helpful. The new sales ring is a huge benefit for both the buyer and seller. Stock can be viewed with ease as they pass through. The quality of stock is very good and well selected, which is important when buying in large numbers. Being able to buy uniform lots of sheep is a big advantage when selecting ewe hoggets for the following year’s sales. I have found that being a member of such a well organised group, like the Mayo Mule Group is very beneficial in selling and buying, getting information and advice. Long may it continue!